It may have not been the worst-case secret of all time, but it was today. 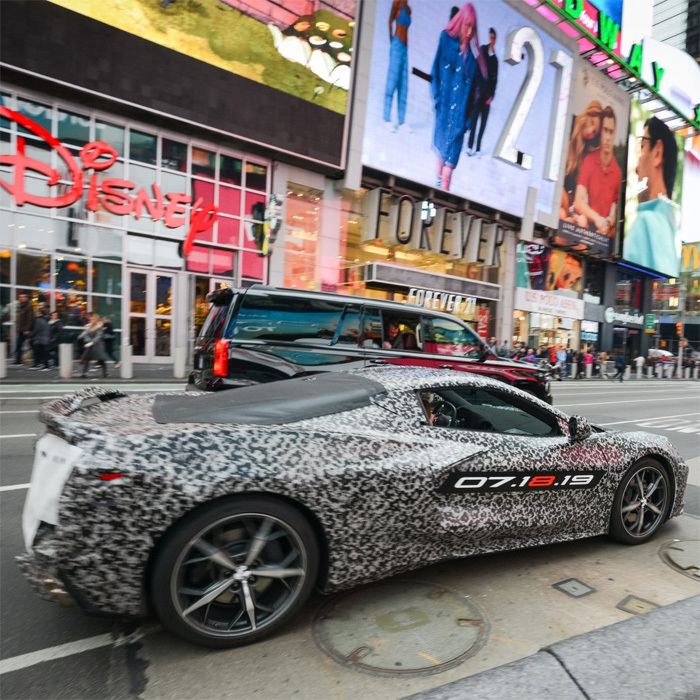 Chatter was high all day as word of a pending announcement regarding the 2020 C8 Corvette swept across the internet like a tsunami wave. 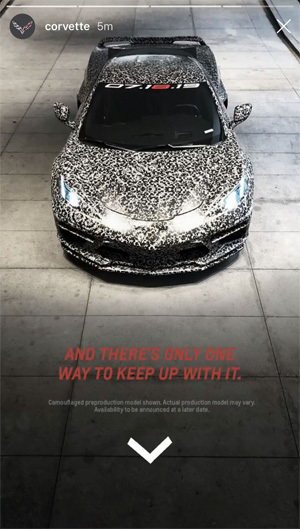 The Corvette team knows that Corvette enthusiasts have been waiting to hear these words for a long time, so it’s bound to get out! 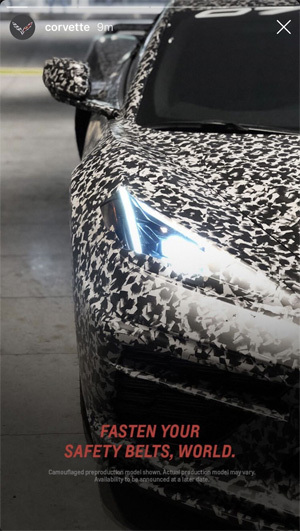 Chevrolet posted a photo of the camouflaged C8 Corvette on their facebook page at 6pm this evening to promote the reveal date for the sports car. The prototype has the date emblazoned on its doors that reads “07.18.19” with the “8” colored in Torch Red. 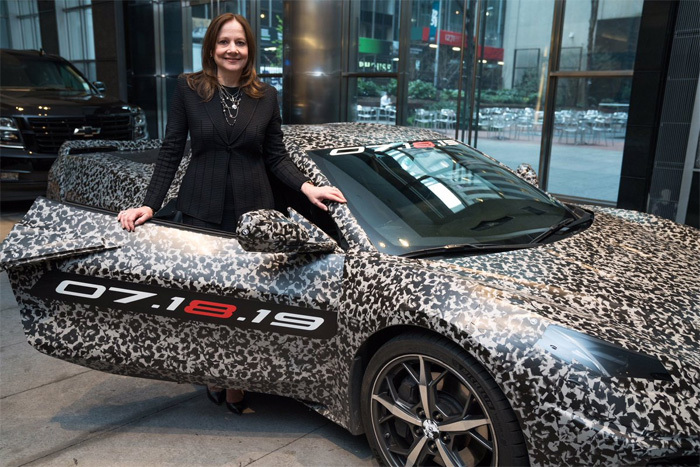 GM’s CEO Mary Barra along with Corvette Chief Engineer Tadge Juechter are in New York City Thursday night to attend the 3rd Annual Stephen Siller Tunnel to Towers Foundation’s Footsteps to the Future Gala in which GM was honored for its 100 years of working with the nation’s military. At the Tunnel to Towers Gala, Barra is expected to make that announcement. But first they had to get there! 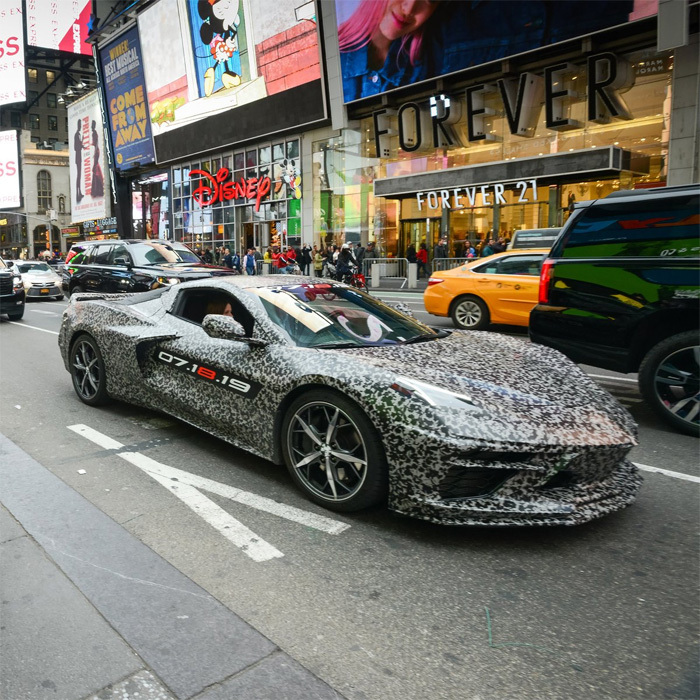 So why not drive a camouflaged C8 Corvette through the streets of NYC at rush hour that is sure to score plenty of attention! 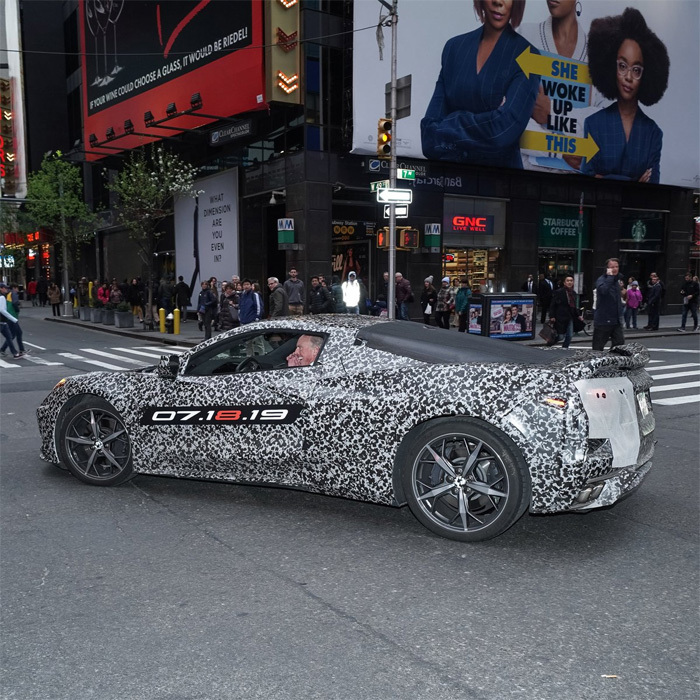 This is the first time that GM has officially recognized the existence of the C8 Corvette, and hopefully that will make life a bit easier for those on the Corvette team. In the announcement, there was no mention of where the reveal will be held. We do know that July 18th is the final day of the NCRS Nationals in Greenville, SC., but at this point, it’s still anyone’s guess. 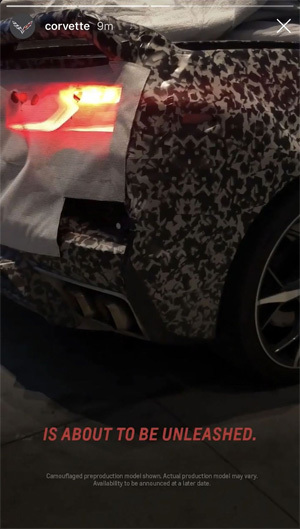 And here is a start-up video of the C8 so turn up those speakers! 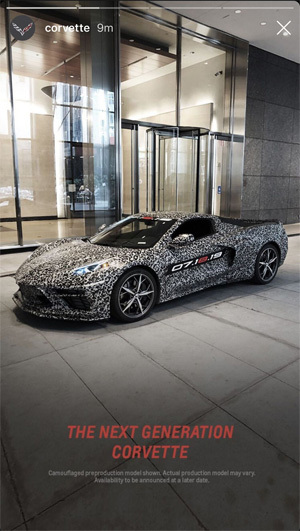 Corvette’s move to a mid-engine platform is one of the biggest changes for the sports car in its 66-year history. The mid-engine Corvette platform was famously championed by the first chief engineer Zora Arkus-Duntov from the late 1950s through his retirement in the mid-1970s. Zora believed that the characteristics of the rear/mid-engine car which include better weight distribution and handling would be essential for competition against manufacturers that had ME race cars like Porsche, Ferrari, and the Ford GT40s. Current chief engineer Tadge Juechter has also sung the praises of the mid-engine platform over the years. 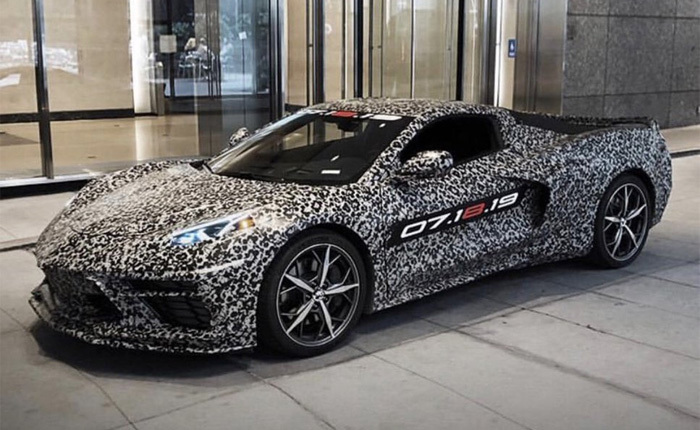 The 2019 Corvette ZR1 with its 755-hp and 715 lb-ft of torque stands as the pinnacle of performance for the front-engine/rear-wheel-drive sports car and it’s been said that they are at the point where they just can’t take it any further because of its limitations. [PIC] Does This Mid-Engine Silhouette Offer A Glimpse of the Future? We’re in the Endgame, now. 07-18-19 is that a refernce to horsepower 718? 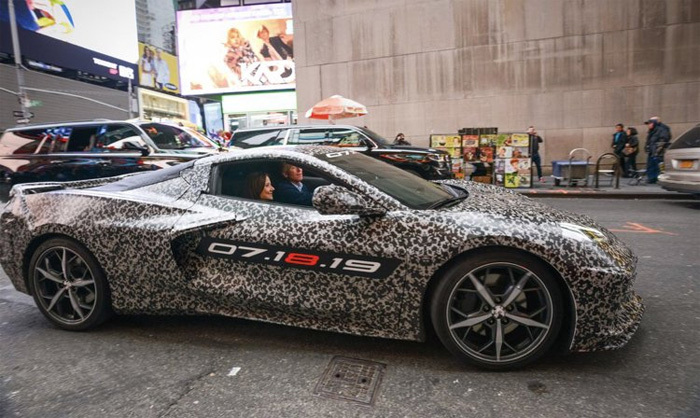 Duntov is smiling…….his dream fulfilled……..and this is all a result of Mark Reuss’s perseverance, and passion for the Corvette ! 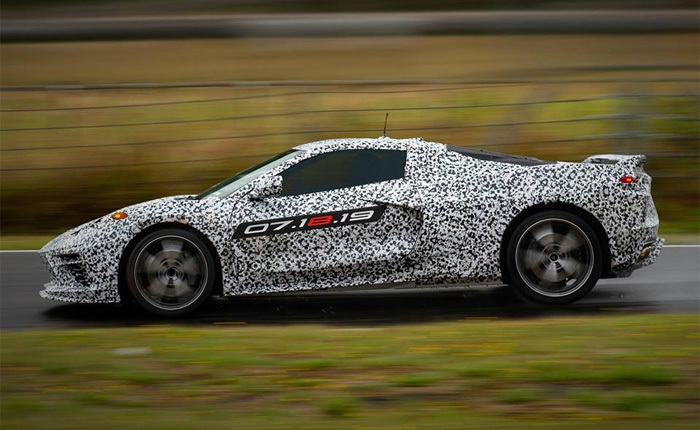 Good to see the C 8 is here and good to see it, that made me smile, now we will see more of it. I hope I can get one before it gets cold. Deposit made. Let’s do this!! Can’t wait for the Z06 equivalent to come out. That will be a game changer in performance. May have to trade in my ‘15 Z06. Mark B Walker, no it won’t be the initial HP, perhaps in a “Z06”. They will start in the neighborhood of 450 or so. The announcement is good, but remember. Salable models will lag behind that. Bugs still need to be worked out and salable won’t be there until later in the year. Test vehicles are being built as we speak. But as the story says, it’s coming!